The 46 metre motor yacht Katya, listed for sale by Joe Foggia at Northrop & Johnson, has been sold with the buyer introduced by Chris Collins at Ocean Independence. Built in GRP by US yard Delta Marine to Lloyds class and MCA compliant, Katya was launched in 2009 and went on to become a finalist at the 2010 World Superyacht Awards. Her interior resonates with richness and warmth. The woods chosen, dark khaya veneers and cinamora burls accented by maple, amboyna burls and mahogany, provide an elegant contrast to her light furnishings in marble, leather and rich fabrics. 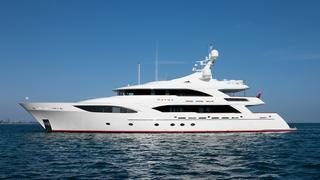 Katya can comfortably accommodate 12 guests in five cabins. The full-beam master suite is located forward on the main deck and there are a further four cabins below, including the ‘Katya cabin’, which is specifically designed to accommodate up to four children with a double bed, single bed and additional Pullman berth. All cabins have full en suite bathroom facilities. The main saloon offers panoramic views through large windows and curved glass entry doors flanked with a mirrored set of bar cabinets. Further forward is the formal dining area with a custom mahogany dining table and matching buffet units port and starboard. Outdoor entertaining and dining is well catered for on the spacious sun deck, equipped with a spa pool, plenty of sunbathing areas, a day head, stow away gym equipment and a full wet bar with a grill, great for al fresco cocktails and meals while enjoying the marvelous views. Twin Caterpillar 3508-B engines deliver a transoceanic range of 5,000 nautical miles at 12 knots. Katya was asking $19,950,000 and will be renamed Avalon.